Serim Monitor strips allow testing at various point-of-use locations where diluted bleach is used as a hard surface disinfectant. Review applicable regulations and manufacturer's recommendation to determine appropriate testing requirements. Using a bleach solution in which the free chlorine concentration is too low will not thoroughly disinfect surfaces. However, using an unnecessarily high concentration of chlorine may leave an unhealthy residue or cause metals to corrode. The goal is to develop cleaning/disinfecting methods that effectively rid surfaces of soil and micro-organisms without overusing chlorine. Serim Monitor strips are supplied in ready-to-use, dip and read form. When placed in contact with the sample according to the directions for use (see below), the indicator pad changes color relative to the concentration of free t chlorine. Color blocks are present a 100, 200, 350, 500 and 750 ppm. Note: Test strip cannot distinguish free chlorine concentrations above 800 ppm. Test Strip Technique Immerse indicator pad in sample for a full two (2) seconds. Shake strip firmly to remove excess sample. Results At 90 seconds compare the color in the center of the indicator pad to the color chart on the bottle label. Disregard color around the edge of the indicator pad. Note: The test strip cannot distinguish free chlorine concentrations above 800 ppm. 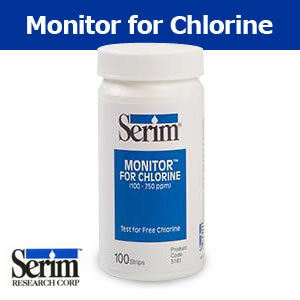 Store bottles of Serim Monitor for Chlorines at temperatures between 15°-30°C (59°- 86°F).